Let’s explore distance on the coordinate plane. Plot points in your assigned quadrant and label them with their coordinates. Next to each point, write its coordinates with the Text tool or Pen tool. Answer these questions for each pair of points. How are the coordinates the same? How are they different? How far away are they from the y-axis? To the left or to the right of it? How far away are they from the x-axis? Above or below it? Point $F$ has the same coordinates as point $C$, except its $y$-coordinate has the opposite sign. Plot point $F$ on the coordinate plane and label it with its coordinates. How far away are $F$ and $C$ from the $x$-axis? What is the distance between $F$ and $C$? Point $G$ has the same coordinates as point $E$, except its $x$-coordinate has the opposite sign. Plot point $G$ on the coordinate plane and label it with its coordinates. How far away are $G$ and $E$ from the $y$-axis? What is the distance between $G$ and $E$? Point $H$ has the same coordinates as point $B$, except both of its coordinates have the opposite signs. In which quadrant is point $H$? Label each point with its coordinates. Find the distance between each of the following pairs of points. Which of the points are 5 units from $(\text-1.5, \text-3)$? Which of the points are 2 units from $(\text0.5, \text-4.5)$? Plot a point that is both 2.5 units from $A$ and 9 units from $E$. Label that point $F$ and write down its coordinates. Do you agree with either of them? Explain your reasoning. 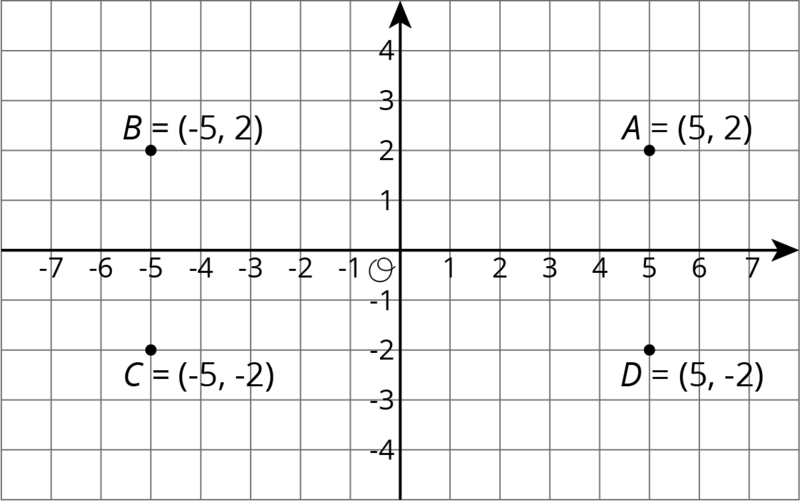 The points $A = (5, 2), \,B = (\text-5, 2), \, C = (\text-5, \text-2)$, and $D=(5, \text-2)$ are shown in the plane. Notice that they all have almost the same coordinates, except the signs are different. They are all the same distance from each axis but are in different quadrants. We can always tell which quadrant a point is located in by the signs of its coordinates. If two points have $x$-coordinates that are opposites (like 5 and -5), they are the same distance away from the vertical axis, but one is to the left and the other to the right. If two points have $y$-coordinates that are opposites (like 2 and -2), they are the same distance away from the horizontal axis, but one is above and the other below.